If you’re looking fora simple text slider to use in your wordpress theme there is one I’ve used on a couple websites such as Dorval Films and the Travel Guy website that I recommend. You can easily add new text slides in just minutes. When creating text slides there are two parts to be added. Your main text or heading of your slide and your subtext or content associated with the slide. Once you’ve successfully created your slides you can just use the highlighted shortcode below and embed it within the content of your page. 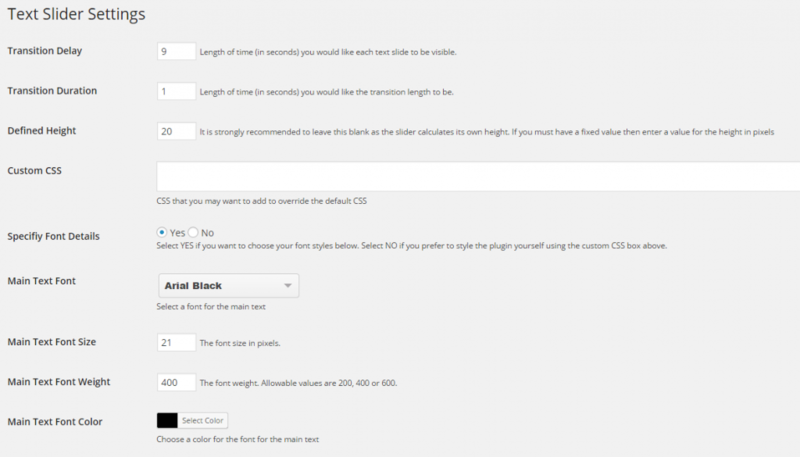 You can also control the styling of your slider by changing the parameters below through your dashboard.